Once in a while one finds an album on metal forums that's self-released, goes almost completely under the radar of most reviewers, but is a real gem nonetheless. 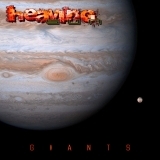 Heaving Sun's debut full-length, Giants, is such an album, and as a concept album it's definitely interesting, as it's not every day that I review an album featuring humanity's defeat by powerful aliens from Jupiter. Yes, you read that right. Giants is a strange blend of death and doom metal, thoroughly enjoyable to listen to as either a full album or background music in the headphones. A quiet horn introduces the first dragging riffs of Speed of the Universe, with gritty, downtuned guitars. Clearly, the speed of the universe, as played by instrumentalist Alan Stares (he does guitars, drums, synths, and bass -- the lot), is pretty slow, at least at first. Simon Palmer, the vocalist, gives a deep Swamp Thing-style growl that put me in mind of Shagrat of Acid Witch, and certain parts of the forthcoming songs remind me of that band too, as the songs range from slow and crushing to death metal riffs. This one has a spoken-word paraphrase from a J. B. S. Haldane paper, which is a nice touch. Solar Flare Blastpoint's speed doesn't change much, but Stares fits blast-beat drumming through the chorus of the song, giving it a similar feeling to certain of Vader's slower songs, except that the spoken-word parts here are run through a robot-voice filter, while Might of the Planet Builders, one of my favorites, has the doom metal giving way to an unexpectedly pretty solo. After a break with Transmission/Starmad, which is mostly composed of spoken-word pieces and samples apparently meant to evoke a lost spaceman's signal-distorted transmission and subsequent remembered moments of his spacecraft's destruction, the next two songs go to the aliens' plans for Earth, both with a death metal sound. The Jupiter Syndicate, definitely the most death-metal song on the album, combines the distorted vocals from before with harder and faster blastbeats at the beginning, changing to a slower, hammered-out series of riffs. Planning Permission for the Demolition of Earth, a shorter and simpler song thrashed steadily out at a fast pace, is nice to listen to as well, although I wish they did more with it -- as it is, it's over way too soon. The last two are longer, but they couldn't be more different from each other. Penumbra's an instrumental built like a soundtrack, with a single clean guitar riff that subtly changes through the song until it ends with a mostly-slow, indulgent guitar solo. Wisdom of a Gas Giant, on the other hand, is back to the heavy doom riffs of the first track, but with another solo partway through. Both of these have clear, beautifully-mixed drumming and bass work by Stares that are an even match for the guitar. Giants is shorter than one would wish, but impressive, especially for a debut album. Looking back through the songs, I think what's nice about it is the care taken on all parts of the production by Stares and Palmer -- nothing is gratuitous, the atmosphere (or lack thereof) of deep space is evoked well (especially on Penumbra, and even the 1950s-style sci-fi sampled spoken word pieces fit perfectly with the overall tenor of the music. This is a great start to Heaving Sun's career and a nice little album to pick up.